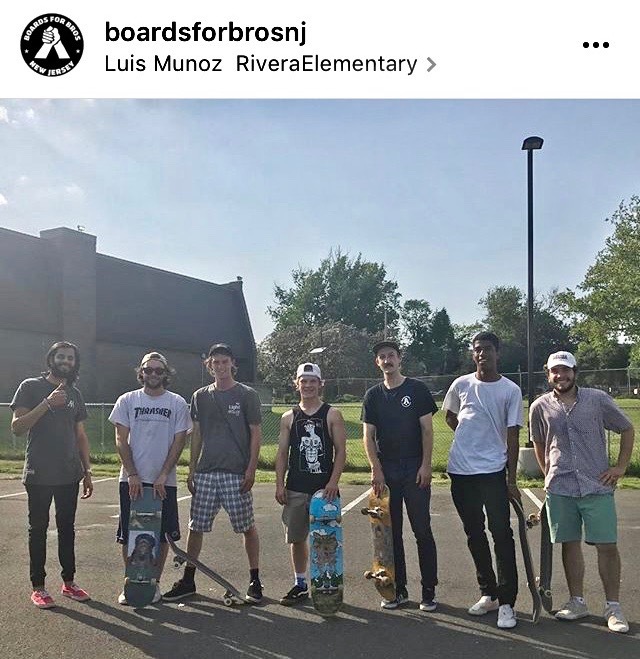 Boards for Bros is a nonprofit that uses skateboarding to help at-risk youth develop creativity, confidence, and perseverance. We work with local skate shops and community partners to collect and refurbish skateboards that we distribute to kids in the community who otherwise wouldn't be able to afford a board. This Summer, we are conducting skateboarding camps and enabling local youth groups to encorporate skateboarding into their ongoing programming. 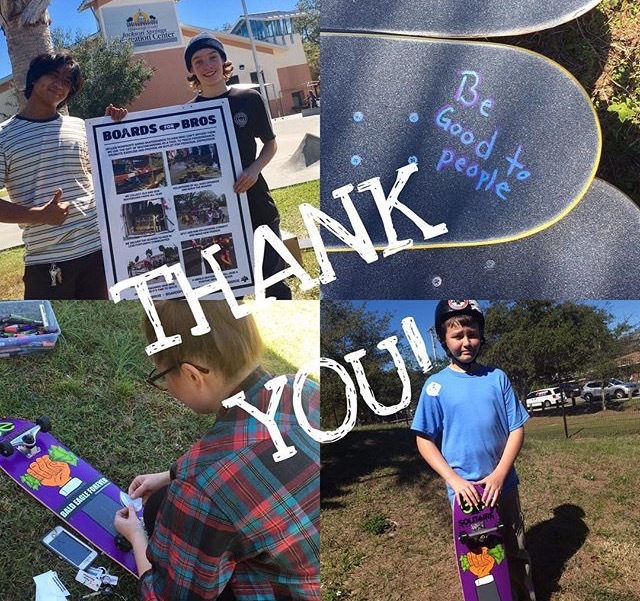 Your contribution is essential and will help us buy the materials we need to make sure every child we work with has a high quality skateboard to use as they learn new tricks and the life lessons skateboarding teaches. Boards for Bros focuses on at-risk youth, but our project engages the entire community. We have donation centers at various locations in New Jersey and Pennsylvania, including NJ Skate Shop, Prime Skate Shop, and Reign Skate. Skateboarders who come to these locations are encouraged to donate new or gently used skateboard parts. 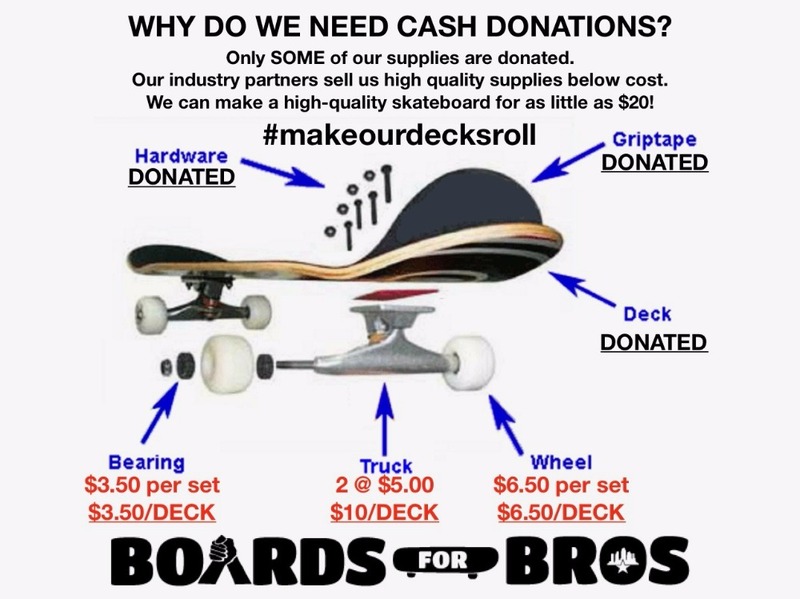 Fundraising helps us fill in the gaps by purchasing the missing parts we need to make complete skateboards. These items are sold to us at or below cost through our industry supporters. Once we've gathered all the necessary materials, we schedule a community build day. These events bring local skaters of all ages and backgrounds together to assemble the boards we will distribute to the kids in Trenton. Finally, we hold a distribution event where we distribute the skateboards we've collected and then spend time skating with the kids who received boards to help them learn the basics they'll need to enjoy their new skateboard. Giving a young person a skateboard invites them to join to a creative, supportive community that encourages acceptance of everyone, regardless of race, socioeconomic status, gender, or sexual orientation. It also gives them an opportunity to learn how to see the world differently, to work through pain and frustration to achieve their goals, and to become confident in their ability to succeed. Your contribution makes all of this possible, and we thank you in advance for supporting skateboarding in the Trenton community. - purchase helmets to take with us to our community distribution events and distribute to the new skateboarders. - purchase portable skate obstacles (at below cost) for our various outreach sites for skate lessons. 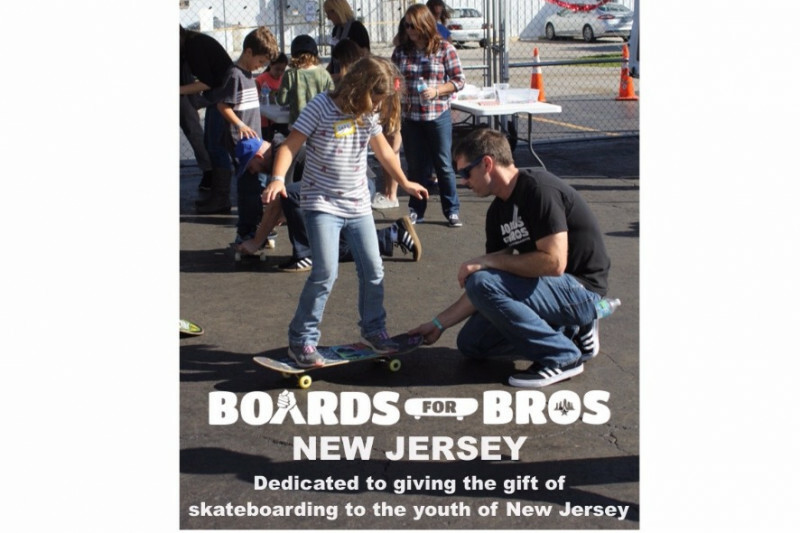 Thank you everyone for your ongoing and generous support of Boards for Bros NJ. We are thrilled to be Sheckler Foundation "Be The Change" finalists for a $10,000 grant. This grant would help us fulfill our dream to bring our Books and Boards Tour to the kids of New Jersey. This is an amazing program that we have been doing in Tampa for almost 2 years now and we would like to expand. 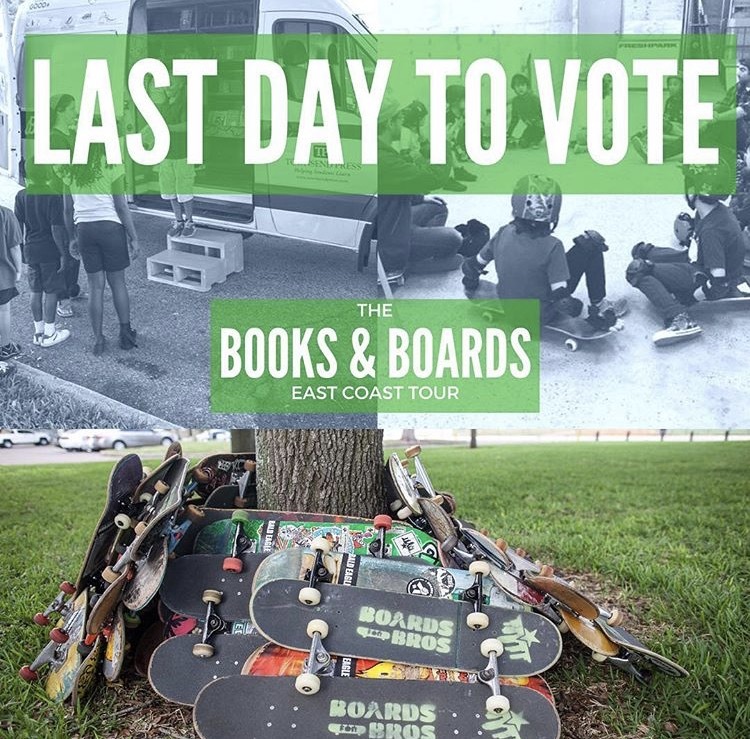 Please check out http://www.shecklerfoundation.org/be-the-change/books-and-boards-east-coast-tour for more information and to vote (today is the last day for voting). Thank you for your support! Books and Boards Tour - NJ Bound! Big thanks to everyone in New Jersey for your continued support of Boards for Bros! We have a ton of youth outreach events planned this summer and we are almost out of skateboards. Please help us to continue our work through July and beyond. Follow us on Instagram and Facebook for updates and info on upcoming fundraisers. Boards for Bros NJ got the first 10 complete skateboards built and ready to go at Prime Skate Shop this past Saturday! Thank you to everyone who made this possible. Helmets have been ordered and we are on track for our Boys and Girls Club distribution in May. Donation dollars at work last weekend! Thank you all so very very much for your support of Boards for Bros New Jersey! We are so excited to put these funds to good use and start planning our next community project. Stay tuned for updates on this skateboard distribution and our future projects to give the gift of skateboarding to the youth of New Jersey. As always, my family loves what B4B does! Thanks for Helping us teach Nate that “the things you love should bring out the best in you” by letting him help so much at build days. Love what you're doing, Jake!